So when I wanted to make these what I had in mind was Lindt balls. 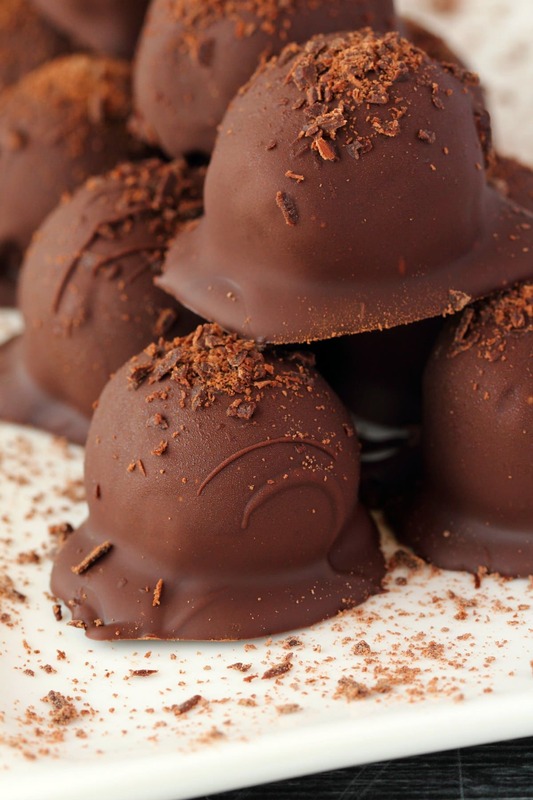 You know those balls that are just filled with liquid chocolate? Yes, those. 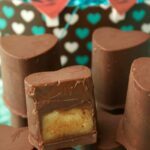 Well of course what I have here with these vegan chocolate truffles is nothing like that! What it is, is a hard chocolate shell filled with a softer chocolate center so it’s close (sort of, maybe, a little bit, nevermind). 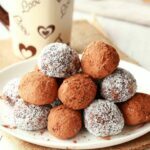 These vegan chocolate truffles are totally divine (even if they are not really anything like Lindt balls). 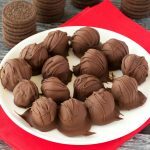 They’re chocolate ganache centers rolled into balls and then rolled in vegan chocolate! 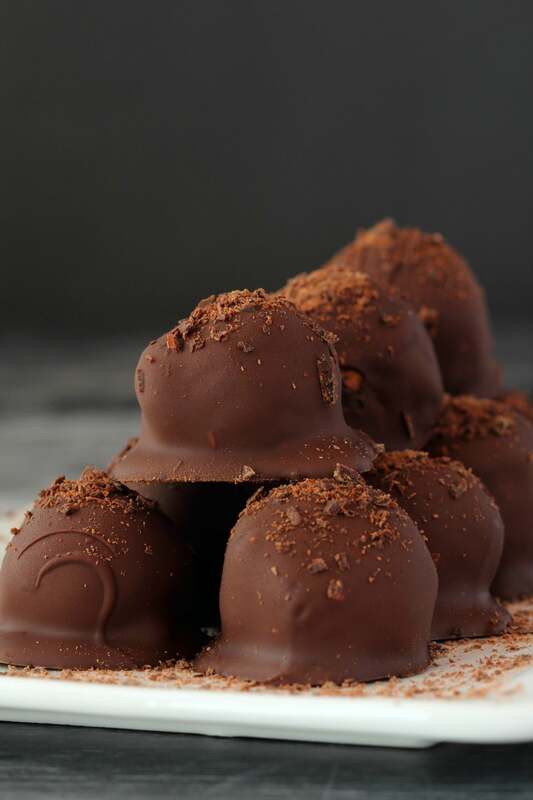 You make the ganache, let it firm up nicely and then scoop it into balls, roll them in cocoa powder, let them set, and then roll those balls in chocolate. It takes a while to make because of all the setting that has to happen, but the actual hands on time is quick and they’re definitely fun to make. The result is also really sensational. 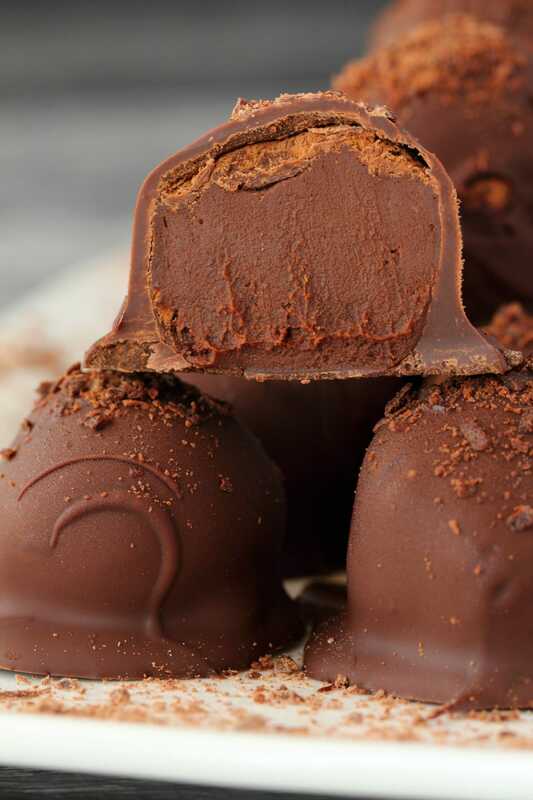 Rolling the balls in cocoa powder before they set and before rolling them in chocolate is just so that you can roll them into balls. 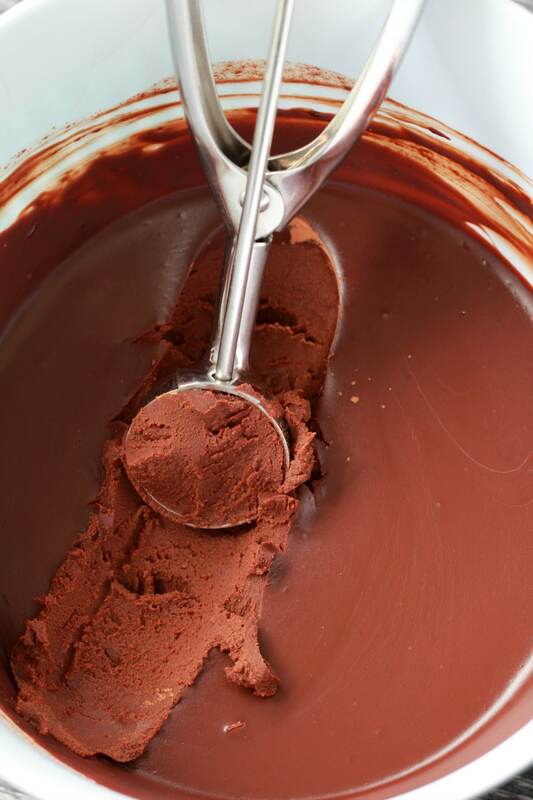 You scoop the ganache with your cookie (or ice cream, whatever you want to call it) scoop and then roll that in cocoa powder and then you’re able to roll that into a ball without that sticking to your hands. 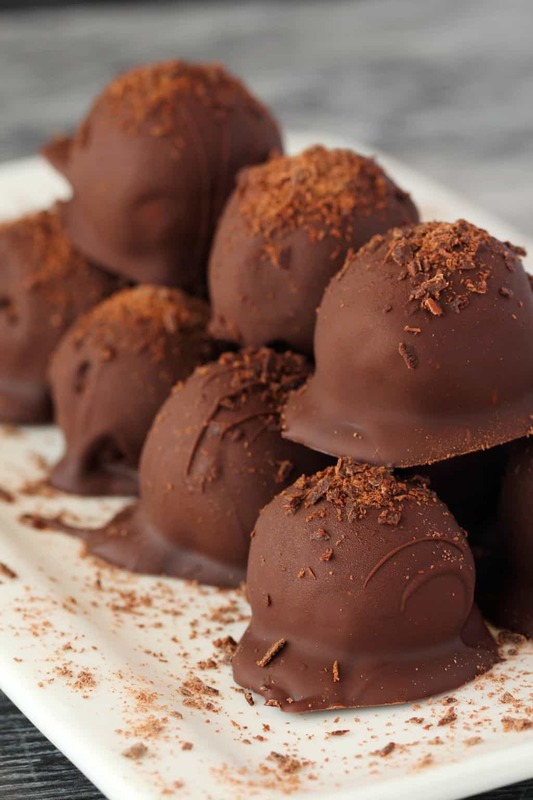 Once dipped in chocolate decorate the balls with chocolate shavings! Keep them stored in the fridge where they will last for up to a week, and enjoy whenever you need a delicious treat! 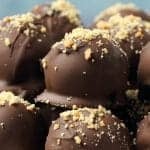 So let us know what you think of these vegan chocolate truffles! 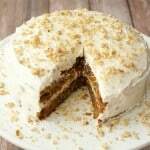 Leave us a comment and please rate the recipe too, it’s so helpful for us. Thanks so much. Place into the fridge to set. This will take a few hours (2-3 hours, you’ll know it’s set when you stick a knife into it and it’s solid all the way down). 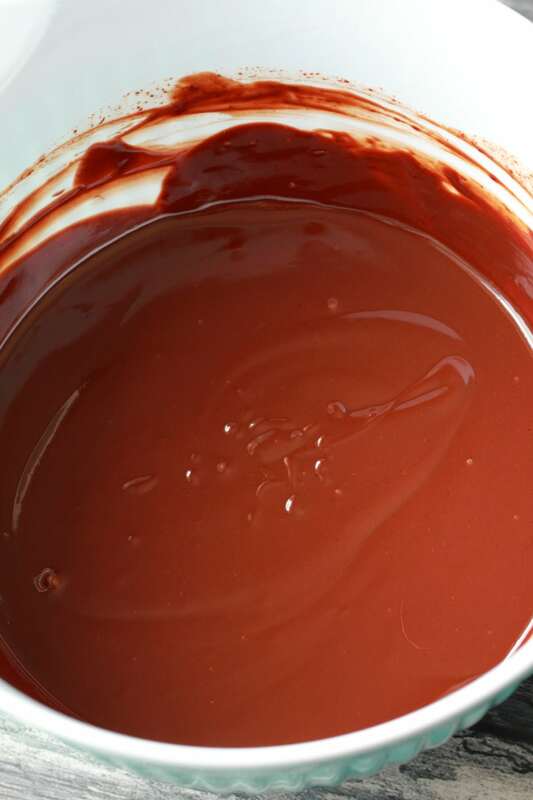 When set, use an ice cream scoop or a spoon to scoop out even amounts of the ganache and drop it into the cocoa powder, then use your hands to roll it into a ball. The cocoa powder will stop it from sticking to your hands. Place the balls onto a parchment lined baking tray. When all the balls are rolled, place into the freezer to harden. 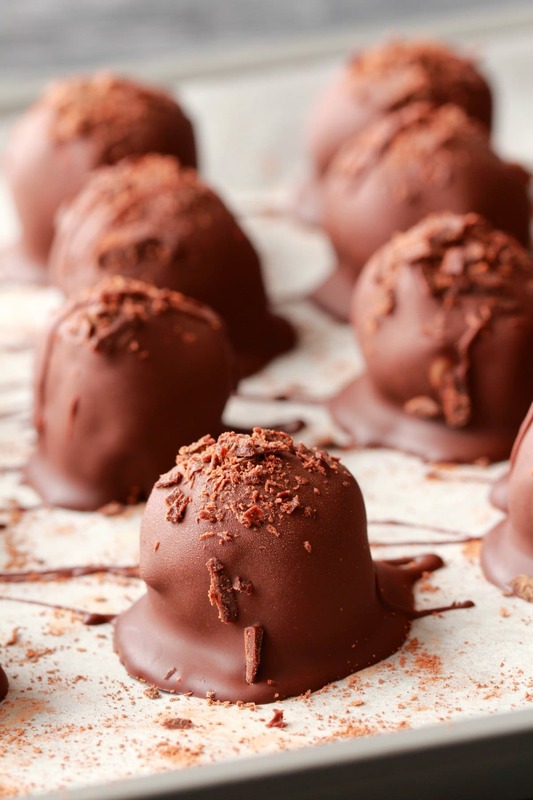 When the balls are nice and hard, break up the chocolate for your chocolate coating, and microwave in 30-second intervals bringing out to stir every 30-seconds until completely smooth and melted. Add in your coconut oil and stir in. Drop the balls into the chocolate one by one and use two teaspoons to manoeuvre the balls in the chocolate and back onto the parchment lined baking tray. 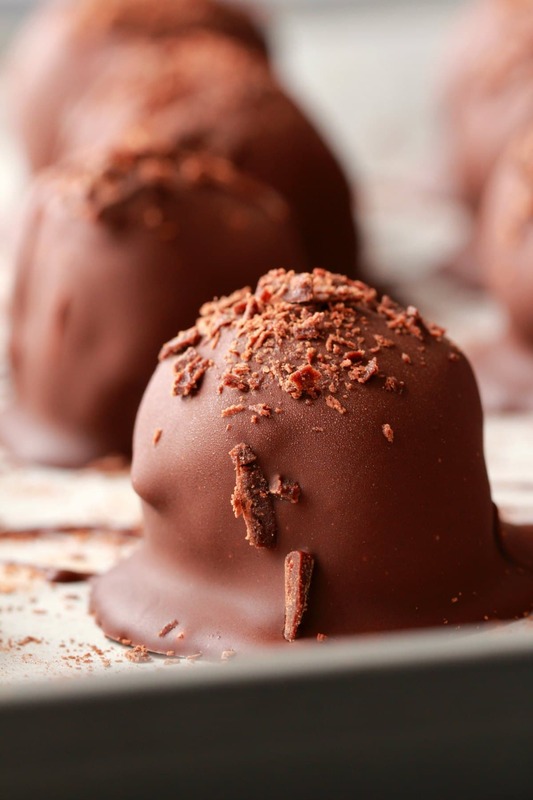 Decorate with chocolate shavings. Return to the fridge for the chocolate to set and enjoy! *You can use any vegan chocolate that you like the taste of, or you can use chocolate chips. If you are using regular vegan chocolate then break it up into pieces and then measure the cup as slightly heaped. If you are using vegan chocolate chips then go with a level cup. Alternatively just weigh your ingredients. *Prep time is only for hands on time and not for time spent setting in the fridge/freezer. 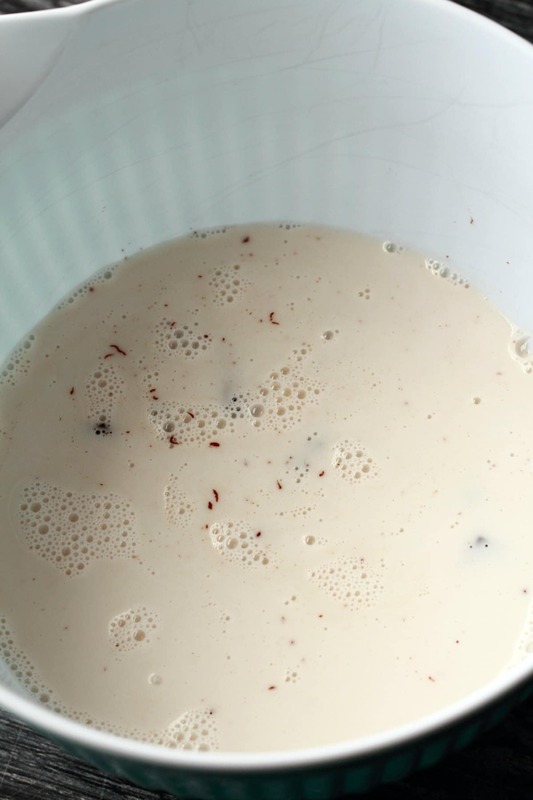 Previous Post: « Vegan Mayo – Rich, Thick and Creamy! 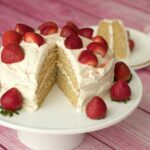 Can you recommend a suitable alternative to coconut cream would love to make these for my friend who has had to go dairy free but also discovered she is allergic to coconut. You could try with a soy based cream or any other non-dairy cream, I haven’t tried it like that but pretty sure it would work as it would be similar in richness to coconut cream. These were amazing! I brought them to a friend’s party and everyone loved them! I presented them as “dairy free” (not wanting to answer 1,000 questions about being vegan) and nobody could believe that they were because they’re so, so cream. Also, they were insanely simple. Definitely going to make these again, and I’m already daydreaming of other ways to use the chocolate ganache center. Hi Ros, was that in the fridge? Hi – just checking these shouldn’t sweat if stored airtight in the fridge like in a Tupperware? These look like they came out fab! Hi Rachel, if they come out of the fridge and sit at room temperature for a bit and the temperature change is quite drastic (like if it’s summer) then they can sweat, but while they’re in the fridge they should be fine and when taken straight out of the fridge and eaten, they should be fine. 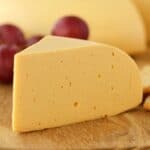 Hi Gwenda, as mentioned in the post, keep them in the fridge where they will last up to a week. I would like to make this recipe. 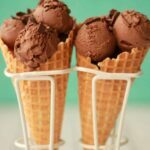 Could you be more specific as to what kind of vegan chocolate you would recommend for this recipe..Thank you for your help with this. Hi Diane, you can use any vegan chocolate that tastes good. Vegan chocolate chips are fine to use too. It’s better not to use a very dark/not sweet variety because there isn’t added sugar to this so if your chocolate isn’t sweet tasting on its own then this will end up being too bitter. I have used various varieties of vegan chocolate for this and it all works fine, if it’s a brand of vegan chocolate that tastes good then that is one that will work well. 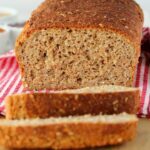 Just tried this recipe – absolutely fantastic! Tried it out on my non-vegan friends who are in denial that these are vegan they taste so rich and gorgeous! Thank you for sharing! Highly recommend. 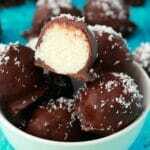 I am Maryam, am searching for a recipe of chocolate truffles I come across your recipe. This is my first time to make chocolate truffles is simple but what I don’t understand is ( vegan brand OR is a chocolate name ) because I see all your recipe is called vegan. 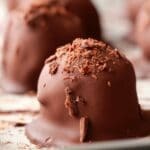 This recipe can l use any type of chocolate? Maryam , Here l am, again!!! Thank you Alison for answering my question, and l understand what is vegan now, l have question to ask pls, do you have recipe on how to make vegan chocolate bar. And can homemade chocolate bar used in any recipe calls for chocolate? 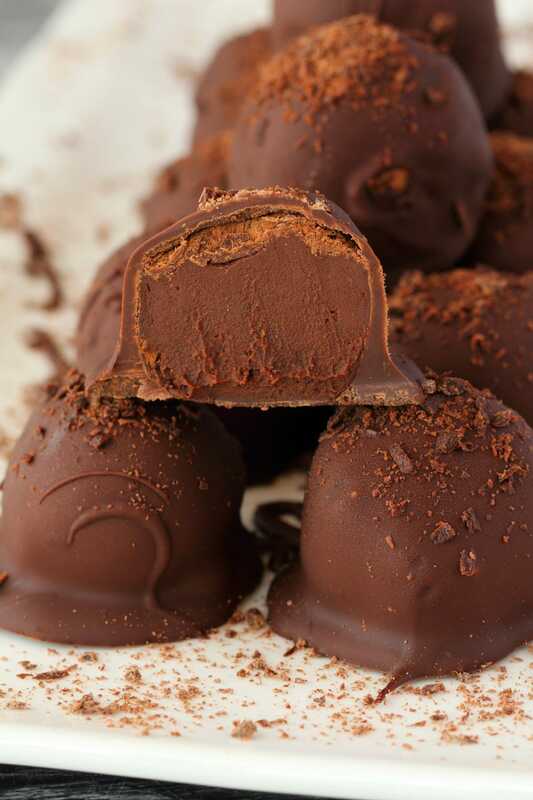 Such as your chocolate truffles. thanks. Hi Maryam, we do have a recipe for homemade raw chocolate. 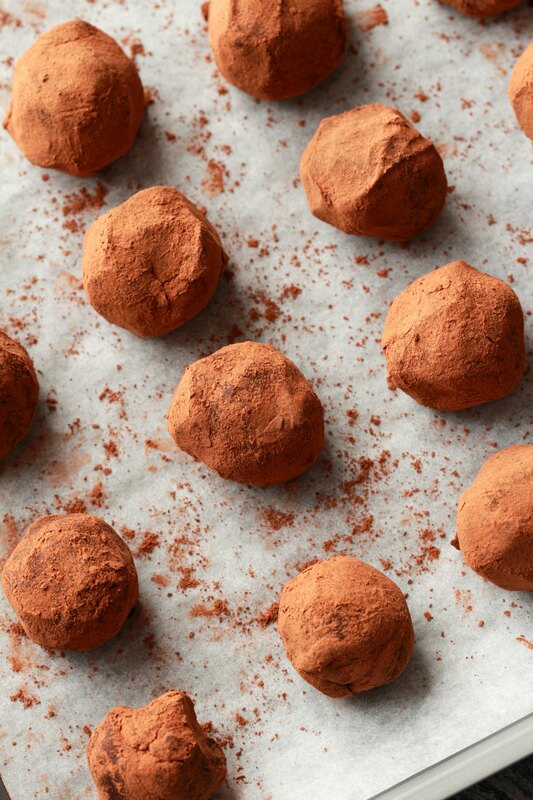 I have not used it in these truffles though, but it is a good basic chocolate recipe. Hi, could you make these boozy? I’m sure you could yes! I have made something similar with boozy chocolate ganache in our kahlua parfaits. The strongest taste is chocolate, the chocolate overpowers the coconut flavor in my opinion. If you wanted to add an orange element, you could try a dash of orange extract. Hello, I want to make these this week, and give them as presents for christmas, how long can these be stored in the fridge for? Thank you! I jumped straight in and made 3 batches in one go. Recommend having another person to help if you do as it’s quite a lot to do! Absolutely amazing. Took around 5.5h from start to leaving them in the fridge to set completely. But would have been a lot quicker if I’d done one batch only. They’re amazing! Well worth the time and def worth doing for presents or for guests!